Hi friends! I apologize for my absence. Unfortunately I will not develop MCD.I don't have enough time and energy. I have to work hard to make money for moving to another city. A small update with the removal of ads and networking features will be released soon. Also will be laid out the source code of the program. Anyone will be able to continue the development of MCD. You were waiting for so long, and finally, Mod Conflict Detector has got a viewer! Now you can browse the content of your *.package files. Advanced User Mode: if you're a beginner, you can hide and don't use a number of features that are for advanced users only. The game dir will be detected automatically now. Duplicate search has been improved. Some changes in pop-up menu. Solved some problems with the settings migration (from one version of the program to another). Starting with this version, the program will delete temporary files of version 1.x. Feature added: mod activation/deactivation. Please note: if you have any mods deactivated in 1.x version of the program, they will be converted after the first launch of 2.1 and will no longer be supported by 1.x (1.x *.disable => 2.1 *.disabled). File analysis runs faster now. One and a half years sure did fly fast, don't you agree? Sorry for being absent, I was helping Putin to train his bears. The program is currently under development, but it's already far better than the previous version. And it's almost bug-free! Fixed some errors; performance improved. Added online features: 'Send error report' & 'Check for updates'. Now you won't miss the next version of the program! Fixed the issue when, if 'Find duplicates' checkbox was ticked off, some files were simply left unchecked. Added feature: 'Customize file colors' (Options > Settings > Colors). You can disable any file (almost; see below), but only disabled files can be enabled. The game file cannot be disabled. CPU loading is more balanced now. 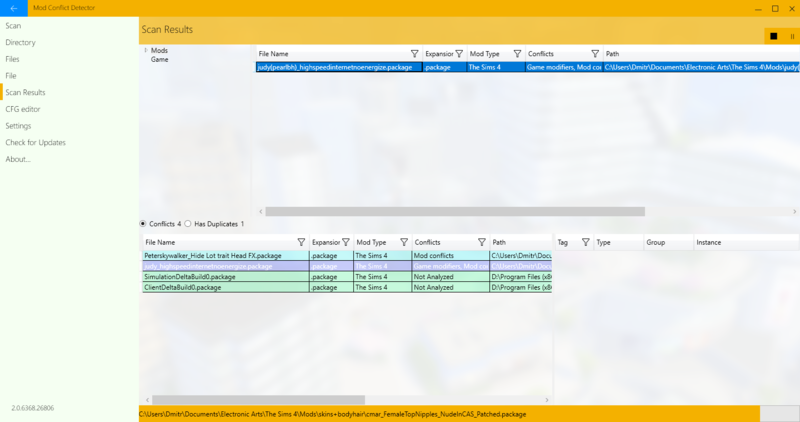 New filters for 'Mod Type' & 'Conflicts' columns. Thanks to Aero&Win10 style, the program will now look the same on any supported OS (WinXP still making the list). Various tweaks and improvements; old errors fixed, some brand new ones were made. NOTE: Please extract all files from the archive into a folder before launching the program! To work correctly, the program needs not only .exe file, but all the provided .dll libraries as well. Hi, my name is DmitryMalfatto. I'm from Russia. 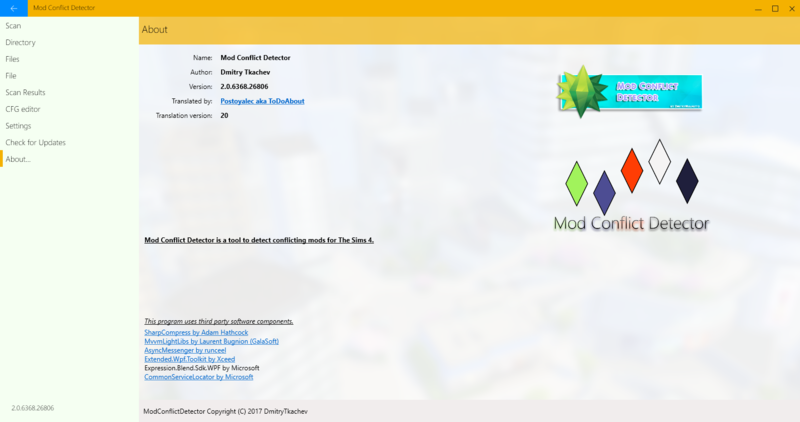 Here's my project, Mod Conflict Detector for The Sims 4. 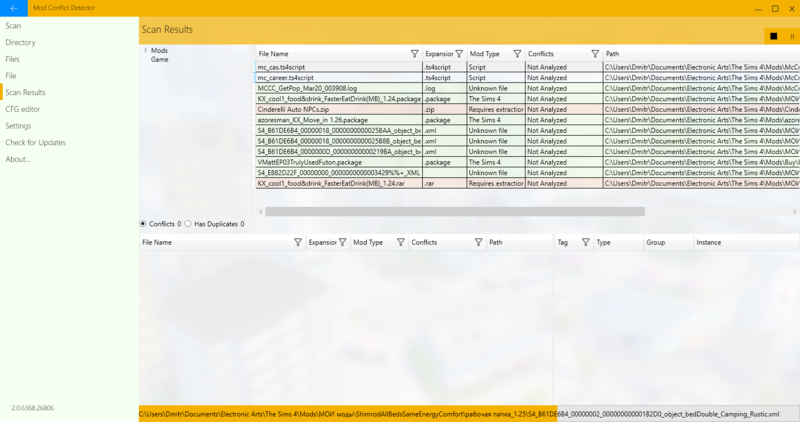 It's a powerful GUI tool for detecting and solving mod conflicts in the game. 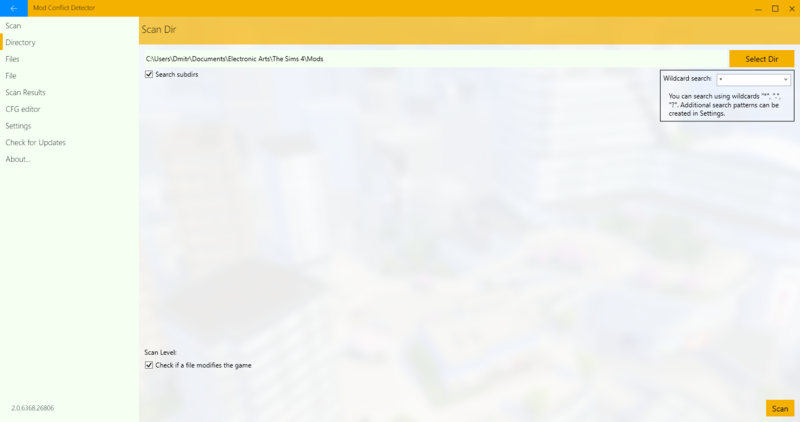 Allows you to get rid of trouble-making mods, empty mods, mods for another games, or technically-not-even-mods, that got in the Mods folder by mistake. I've been developing this program since February 2015, and now it's finally available not only in Russian, but in English as well! Postoyalec [ToDoAbout on MTS] for the English translation.